From left: Dan Cane, CEO of Modernizing Medicine, interviews Danica Patrick during the fourth annual PBSC Foundation STEAM luncheon. A crowd of more than 500 attended Palm Beach State College Foundation’s fourth annual STEAM luncheon today at the Kravis Center for Performing Arts. The luncheon featured NASCAR driver Danica Patrick, the first woman speaker for the event. The event raised money for the Foundation’s STEAM (Science, Technology, Engineering, Arts and Math) initiative to help prepare students for the high-paying, high-demand positions immediately available in these industries. Before Patrick’s remarks, Yvonne Boice, event chair, announced that the Boice Family Foundation would give $150,000 toward student scholarships in STEAM fields. During the conversation-style interview, moderated by Dan Cane, CEO of Modernizing Medicine, Patrick spoke about starting her racing career go-karting with her younger sister, the technology that goes into the design and materials of her race cars, and ways to inspire more young women to enter and stay in STEAM careers. Patrick also noted that although many women see her as an inspiration in the male-dominated world of race car driving, she doesn’t feel the pressure of being a role model to women. “I don’t feel different, and I don’t want to single anyone out because of gender or anything else,” said Patrick. “I never had a role model so I didn’t want to be like anyone else. I just wanted to be the best I could be and I encourage everyone else to do the same. I can give advice to a woman, but I would do the exact same thing for a man,” said Patrick. Patrick also explained some of the key factors to winning a race. Looking to the upcoming season, Patrick says she feels very optimistic, but no matter what the outcome is of any race she will always be making short-and long-term goals which she says is the main reason she wanted to be in the racing business. “I’m doing something I love and truly enjoy, but more so than that I just love to set a goal and accomplish things,” said Patrick. To date, the STEAM initiative has raised $2 million. With those funds, it has created 623 new student scholarships, created 65 new student internships, established 55 new business partnerships and enhanced 66 programs. The event’s presenting sponsor was Bank of America. 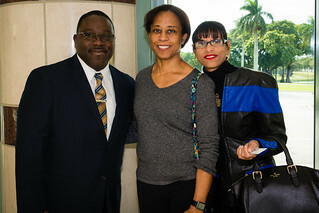 Other top sponsors were Yvonne Boice, Balfour Beatty, FPL, Modernizing Medicine, Palm Beach Broadcasting, Tenet Florida Physician Services, Palm Beach Gardens Medical Center, The Palm Beach Post and WXEL. To learn more about opportunities to support the Foundation’s STEAM initiative, visit www.palmbeachstate.edu/foundation/steam/ or call 561-868-3450. To view photos from the event, click below.